Hello kittens, so day 7 here of The Twelve Days of Christmas! 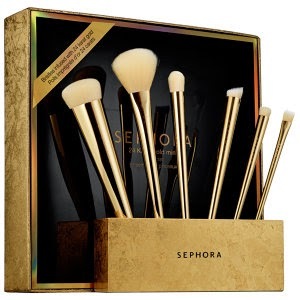 The seventh gift idea I have for you is Sephora's 24 Karat Gold Mine Brush Set! A seven-piece brush set with gleaming gold and black handles in a deluxe display stand. You get seven amazingly stunning brushes! You get a blush brush, a complexion perfecter, a eyeshadow brush, a crease brush, a corrector brush, a liner brush and a brush stand to display your new beautiful brushes on!